This contest has been marked as a duplicate of WatchBack Sweepstakes. Prize: Enter to #win #sweepstakes when you watch content in the WatchBack app. 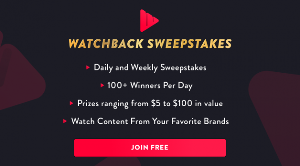 WatchBack is a video streaming platform that allows you to enter sweepstakes while you discover new TV Shows and explore topics you’re passionate about. What you must do to enter: To participate in WatchBack sweeps, please download WatchBack app using provided links and follow these instructions. Statistics: This contest was opened by 13 and entered by 0 ContestChest.com members. 0% of those who opened the contest, entered it.